Hundreds of Mayors from twelve countries of South-East Europe came to Plovdiv, Bulgaria to take part in the Annual Forum of Local Authorities of South East Europe, organized by the Network of Associations of Local Authorities of South-East Europe (NALAS), the National Association of Municipalities in the Republic of Bulgaria (NAMRB) and the City of Plovdiv from 16-19 May 2015 at the International Fair Plovdiv. 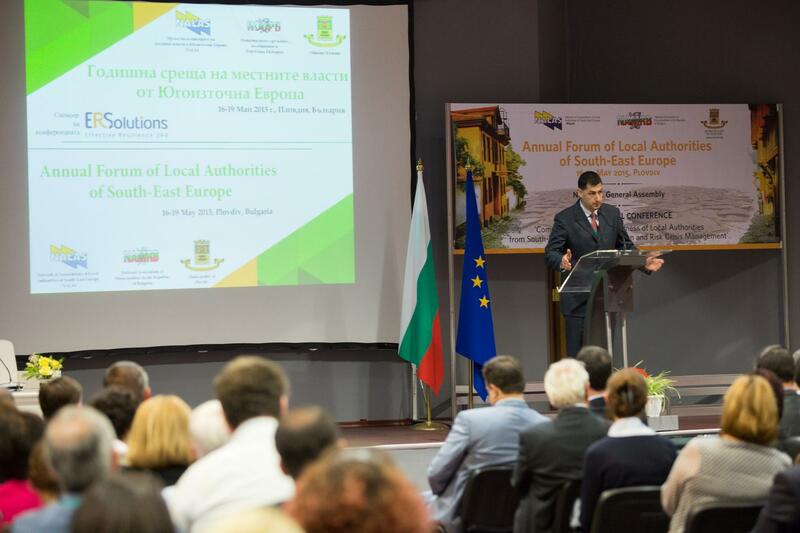 "Such forums are highly in demand especially for the municipalities and especially for those from South-Eastern Europe because of the dynamics of the economic development in the region and the substantial role that the local governments have in the economic life in each and every country. Exchanges of best practice, ideas, lessons learnt, or simple peer-to-peer interactions are in the core of what brings regional dimension for economic recovery and prosperity", said in his opening speech Mr. Djuro Bukvic, the President of NALAS, also President of the Croatian Association of Municipalities and Mayor of Lukac Municipality. 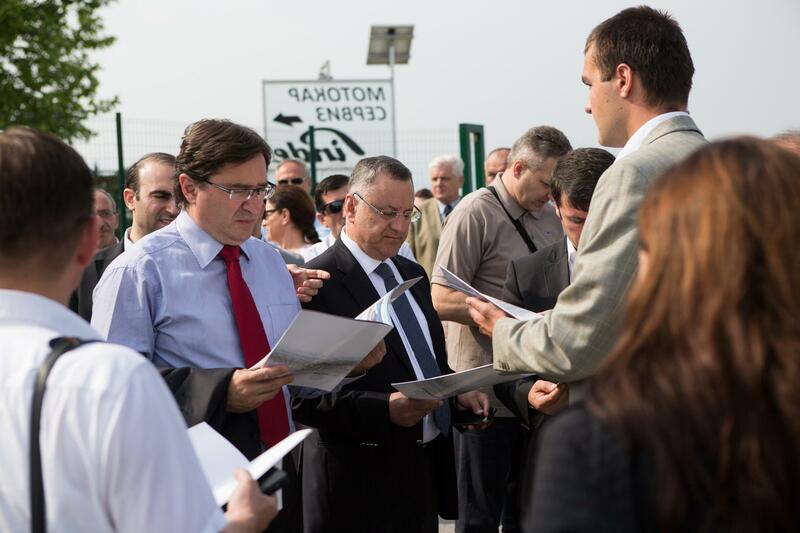 The event started with a site-visit to the Economic and Industrial Zone Marica, that is the home of 110 companies and a real example of public-private partnership. In the workshop that followed the site visit, Mr. Stefan Stoyanov, Deputy Mayor of Plovdiv said: "We have realized that it is not possible to run economic development alone, so we created partnerships that brought 4500 new jobs, mostly for highly qualified staff, mainly in the IT sector". 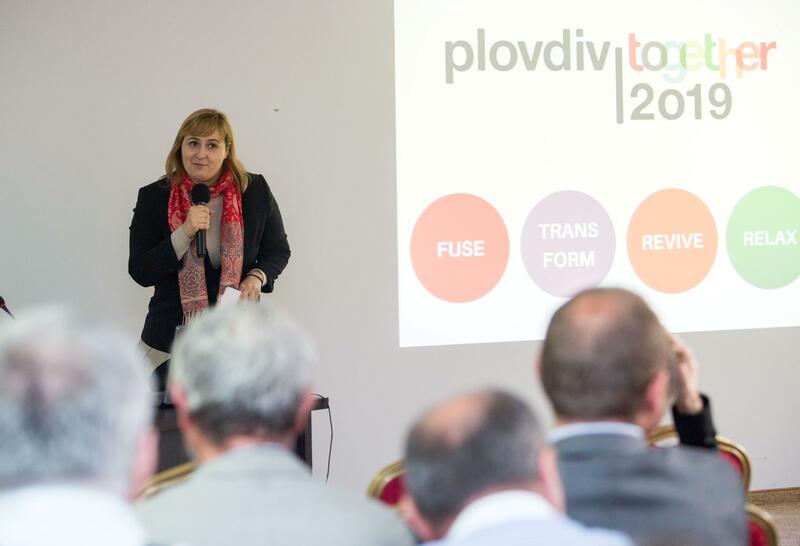 The second workshop was hosted by the Foundation Plovdiv 2019 European Capital of Culture. Ms. Tsvetalina Keransky, the Project Manager of the Foundation explained the importance of culture in sustainable local development. "The activities that the City of Plovdiv implements as the 2019 European Capital of Culture change the cultural, economic and social landscape of the City, with effects to be felt in the next ten years", said Mr. Keransky. The second day of the Annual Forum of Local Authorities of South East Europe continued with NALAS and NAMRB General Assemblies, award ceremony for the gender and youth municipal initiatives, award ceremony for the European Label of Good Governance at the local level and the conference: "Competences and Preparedness of Local Authorities from SEE for Risk Prevention and Crisis Management". 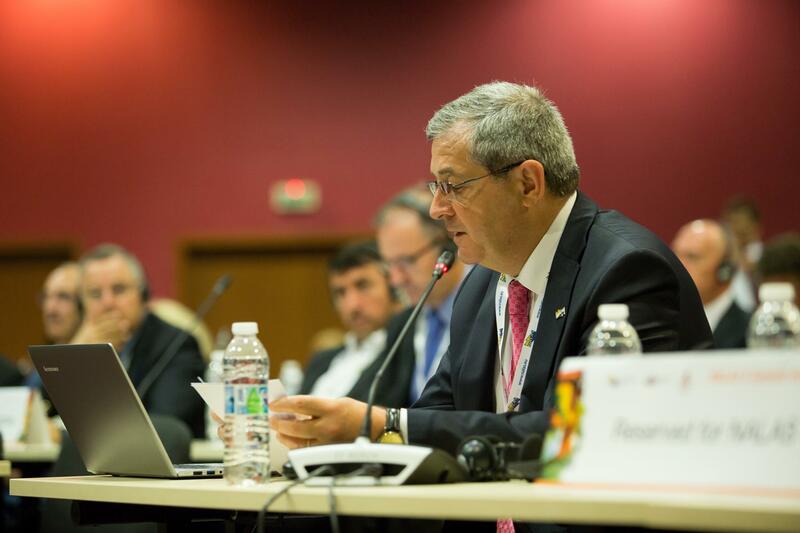 In his address at the tenth NALAS General Assembly, Mr. Gazmend Turdui, Deputy Secretary General of the Regional Cooperation Council said: "A lot has happened since we meet last April in Sarajevo for your General Assembly meeting. We have seen regional cooperation really pick up speed with several high-level political initiatives being launched, and we have also seen a strong shift in approach to enlargement from the EU’s side, with the introduction of economic governance as one of the three pillars of enlargement policy, together with rule of law and public administration reform". 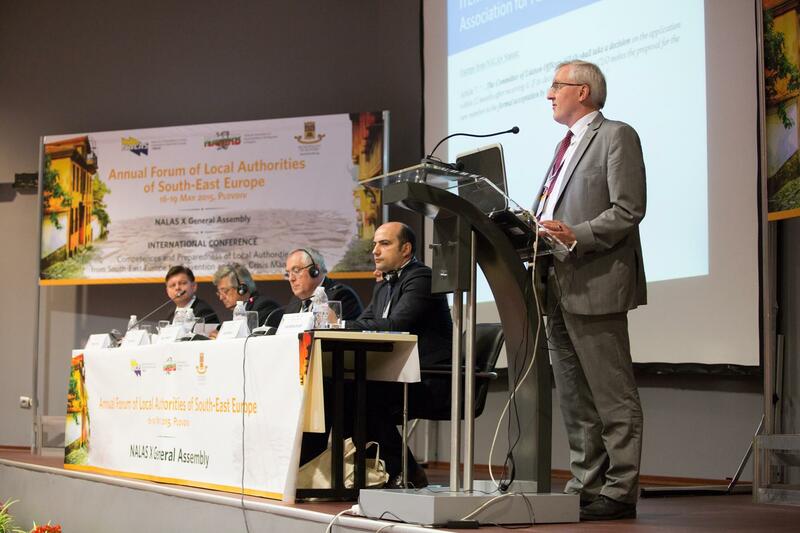 "Your strong Network has a crucial role in consolidating local democracy in SEE", said Mr. Tim Lisney from the Congress of Local and Regional Authorities of the Council of Europe. "For the Congress, NALAS is a genuine success story and the Congress will continue to provide its political support to NALAS activities and initiatives". The delegates of the NALAS General Assembly, Mayors from all member LGAs approved Network's Annual Report for 2014 and the Work Plan for 2015. Unanimously, the delegates approved the application of the Austrian Association of Cities for becoming associate member of NALAS. "We have a long history of cooperation with SEE and we are very happy that now we can continue that collaboration. We are ready to contribute to a greater Eurpe, a more pecaful Europe for all its citizens", said in his speech Mr. Alexander Liesing, Executive Director of the Austrian Association of Cities. 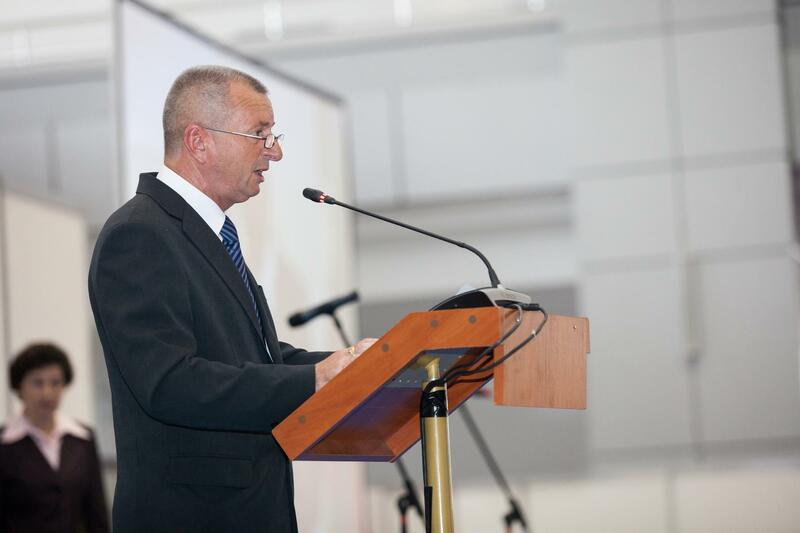 According to the rotation presidency system, Mr. Emil Draghici, Mayor of Vulcana-Bay, Romania and President of the Association of Communes of Romania became the new NALAS President for the next year. Mr. Naim Ismajli, Mayor of Shtime and President of the Board of the Association of Kosovo Municipalities became the first NALAS Vice-President, Mr. Mićo Mićić Mayor of Bijelina and President of the Association of Local Governments of the Republic of Srpska, Bosnia and Herzegovina, became the second Vice-President of NALAS, while Mr. Darko Fras, Mayor of Sveta Trojca in Slovenia became the third NALAS Vice-President. 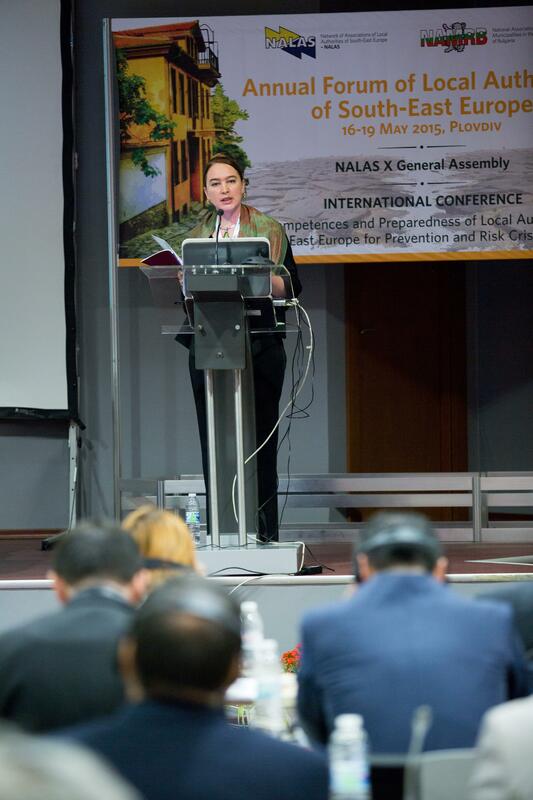 NALAS partners hosted thematic presentations during the General Assembly. Ms. Sabine Palmreuther presented World Bank's Urban Partnership Program, Mr. Christophe di Marco presented the possibilities for cooperation with the Open Regional Fund-Modernisation of Municipal Services, while Mr. Thomas Prorok presented the opportunities arising from the Building Administrative Capacities in the Danube Region (BACID) Programme. At the General Assembly a ceremony for the GENiYOUTH Gender and Youth Municipal Initiatives Awards was organized, acknowledging the best practices in gender and youth mainstreaming at local level. NALAS also awarded Marmara Municipalities Union with a special recognition for achieving widest outreach for the GeniYouth municipal awards open call. These initiatives are a true example of local government and local communities commitment to create a better and more equal world for all. The best practices enrich NALAS knowledge centre in the Gender and Youth area and it is hoped hope that they will serve as motivation and inspiration to other municipalities to implement activities that will strive to ensure inclusion of all citizens in local government issues. This activity has been implemented with the support of the GIZ Project for Institutional Support to NALAS. 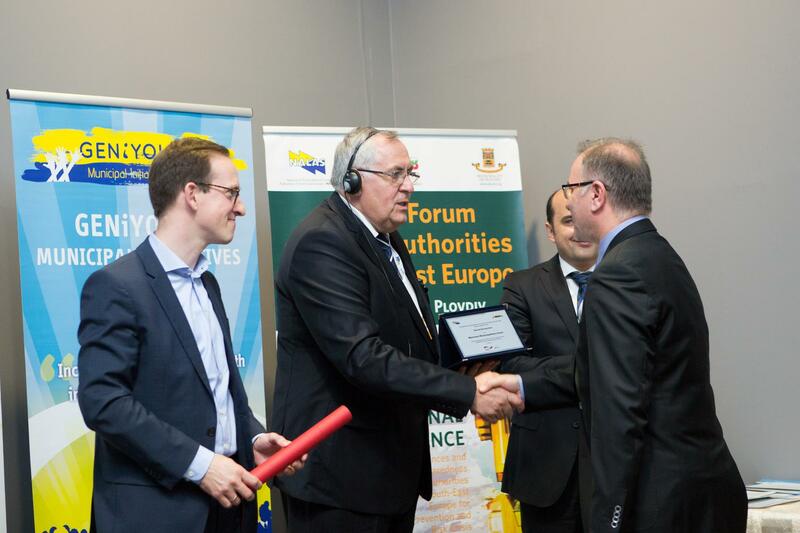 Conference: "Competences and Preparedness of Local Authorities from SEE for Risk Prevention and Crisis Management"
As of May 2014, SEE Region was hit by the worst ever floods, that made huge material damage and took victims. The situation in many municipalities was serious, villages were cut-off, roads and houses were destroyed by the floods and the land slides, while citizens were displaced. The consequences of these floods were severe and the recovery is still ongoing. 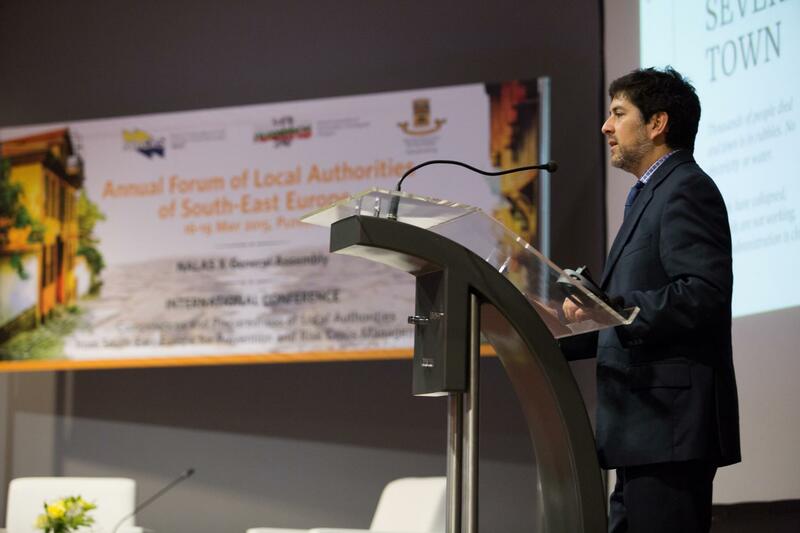 In this difficult period, NALAS Network demonstrated its solidarity, provided immediate help and designed actions to increase the level of preparedness of local governments and their associations to better meet all future challenges. The conference "Competences and Preparedness of Local Authorities from SEE for Risk Prevention and Crisis Management", gathered over 400 Mayors, representatives of national institutions, local governments, local government associations and donors to discuss the challenges local governments phased during the crisis, lessons learned and actions undertaken to improve risk prevention and crisis management. 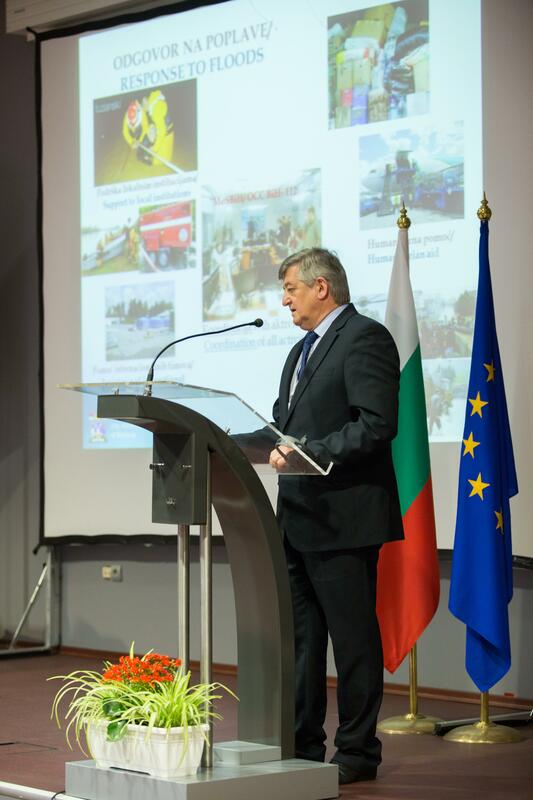 The conference was opened by the President of Bulgaria, Mr. Rossen Plevenliev, who emphasized the solidarity among municipalities demonstrated during the floods in Bulgaria and the Region. 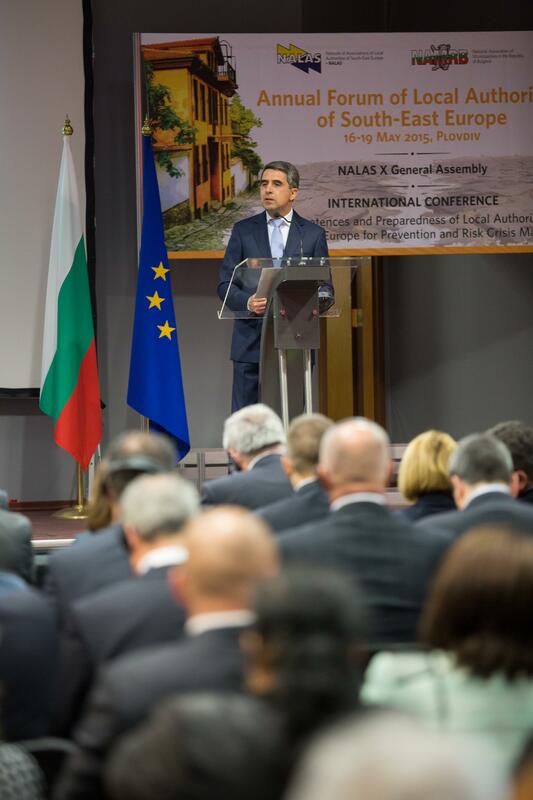 "Bulgarian municipalities are committed to collaboration with the whole Region, aware that together we can do more. We are proud of this cooperation. During the devastating floods in 2014 Bulgaria was one of the first countries that offered help", said President Plevenliev. In the same line, in his speech, Mr. Ivan Totev, the Mayor of Plovdiv, said: "The topic of today's conference is more important than ever, for the local governments especially. Crisis are not new, what is new is our changing approach of increased solidarity demonstrated in the last years, that became evident during the 2014 crisis. 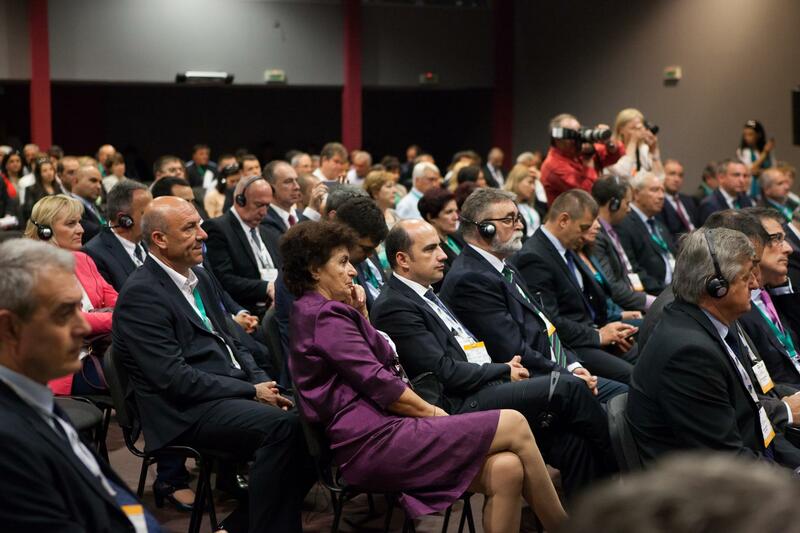 I hope this conference will help us be better, prepared, cooperate better and have better results in managing crisis". Mr. Joaquin Toro, World Bank Senior Disaster Risk Management Regional Coordinator, talked about risk management in natural disasters. "The low preparedness of our countries is due to the low number of crisis we face. Although natural disasters in our region are rare, the history has shown that many of them have been devastating. On the other hand this recurrence gives more time for reconciliation and preparation for the next crisis", emphasized Toro. "The rapid assessment that the World Bank done with the EU showed damage in value of 15% of the GDP of Bosnia and Herzegovina and 5% of the GDP of Serbia, which has severe effect of the economy and life in these countries. In these disasters, local governments were hit the most. Disaster hits cities, municipalities, not countries. Disasters start and end at the local level, but also that is where you address the risk". The session "Local Governments respond to disasters", was moderated by the Mayor of Sofia, Bulgaria, Ms. Yordanka Fandakova. "For me as a Mayor this topic is of an utmost importance. 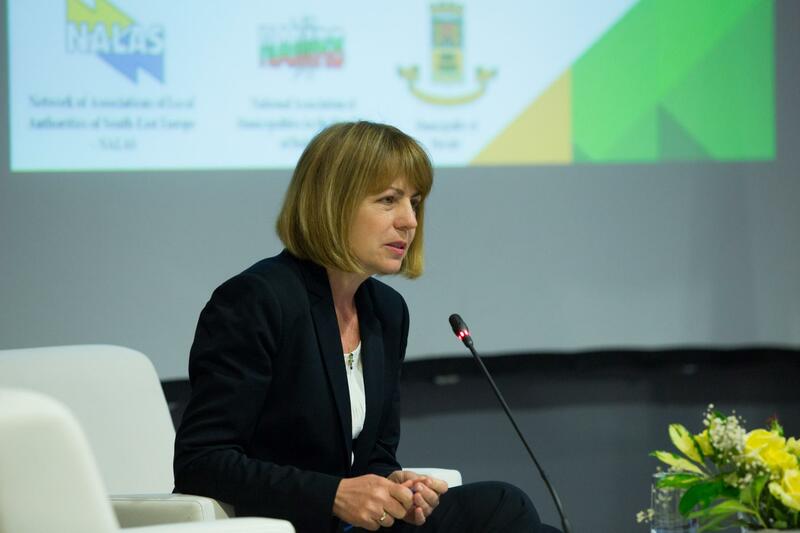 No matter what we do, no matter what investments we bring and make, it can all disappear in a second if we do not have a serious approach towards risk prevention", said Ms. Fandakova. "The issue of solidarity is also very important. We, the Bulgarian municipalities have agreed to establish a solidarity fund. At the recent floods in Bulgaria we have offered immediate help, but such fund will increase the efficiency of the resources and provide fast, coordinated reaction to crisis". 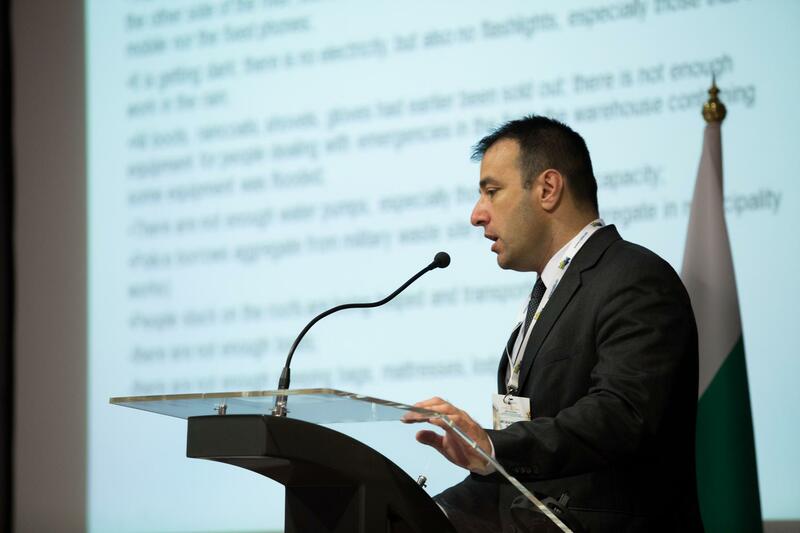 In a very plastic and illustrative manner, Mr. Sasa Paunovic, the Mayor of Paracin, Serbia, explained the main challenges that Paracin faced during the 2014 floods and the lessons learned. "During the crisis we figured out that most of the crisis management plans have been written just to satisfy the legal requirements. For example, the river plan, done at the central level, did not consider the flooding zones. Now we know the zones and are ready for the future challenges", said Paunovic. Mr. Mico Micic, the Mayor of Bijeljina, Bosnia and Herzegovina, talked about the huge damages that the floods made to the region spread along Danube and Sava Rivers, the long period of recovery, but also the future risk preparedness measures undertaken, such as monitoring of water levels, adaptation of road infrastructure, cleaning the channels, river beds, etc. During the discussion, in a very emotional speech, the Mayor of Dobrich, Bulgaria, Ms. Detelina Nikolova said: "At the moment the flood disaster in my region happened I wasn't that upset as I'm today, watching the videos and going back to what happened during these difficult times. We had many volunteers coming, people wanted to help, but we had the challenges to coordinate them. We need a law for volunteering that will put a framework, protect them and coordinate volunteers for the most effective use. As it has been proved today, NALAS is a great mechanism for exchange on this issue and creation of a joint action base. The conference was concluded with the adoption of a joint Declaration on Disaster Risk Management. 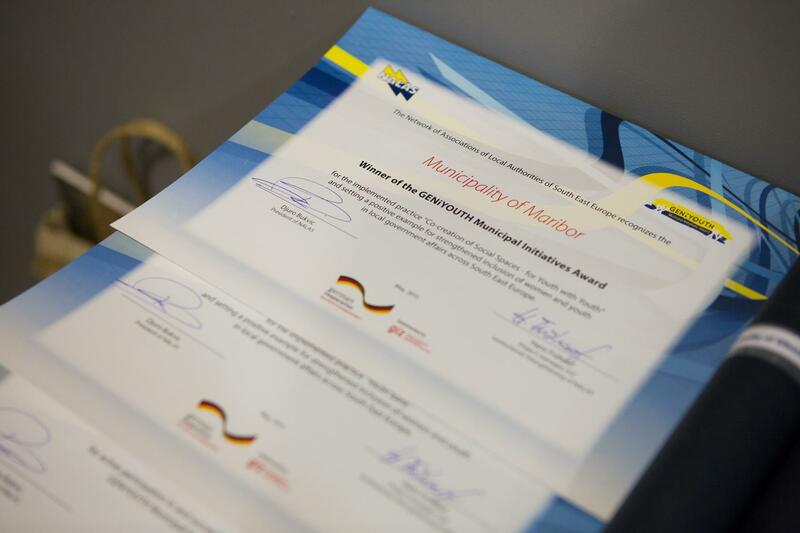 The Declaration calls all relevant institutions to work together in risk prevention and crisis management, by: recognizing that disaster prevention policies are the most effective tool to achieve resilience; jointly elaborating and adopting risk reduction strategies; recognizing the importance of the regional and sub-regional inter-action and solidarity; acknowledging the importance of organized volunteer movement for providing immediate assistance. 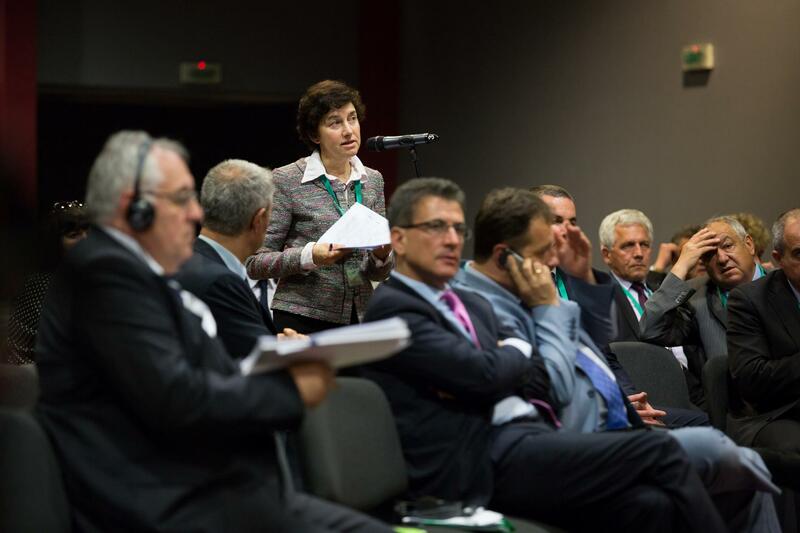 "The Declaration summarizes all we discussed at the conference" said Ms. Fandakova, the Mayor of Sofia, Bulgaria. "I propose we adopt it unanimously and do our best to implement it in practice".